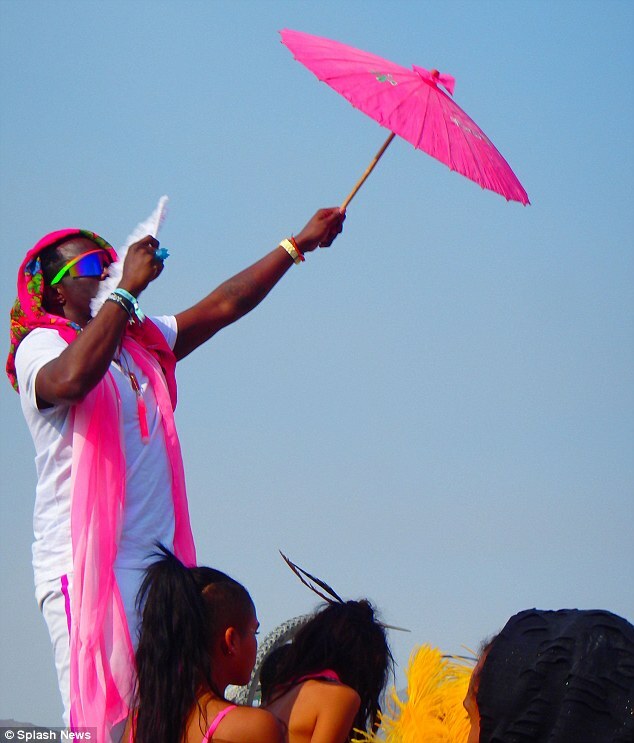 With festival goers encouraged to embrace radical self-expression, the rapper, who is usually seen wearing slick suits and streetwear clothing whilst lounging on his multi-million dollar yacht, donned a pink scarf and held a pink parasol to shield himself from the desert sun. Dancing alongside several other revellers, Diddy also fanned himself with a white feathered fan which matched his white T-shirt and trousers. Diddy was certainly in the mood to party and was up bright and early at around 9am on Sunday in the Robot Heart camp, where famous DJs play electronic music to thousands of party goers. A fellow reveller said: 'The conditions are harsh with frequent sand storms and over 100 degree heat in the day and temperatures in the 40s at night. 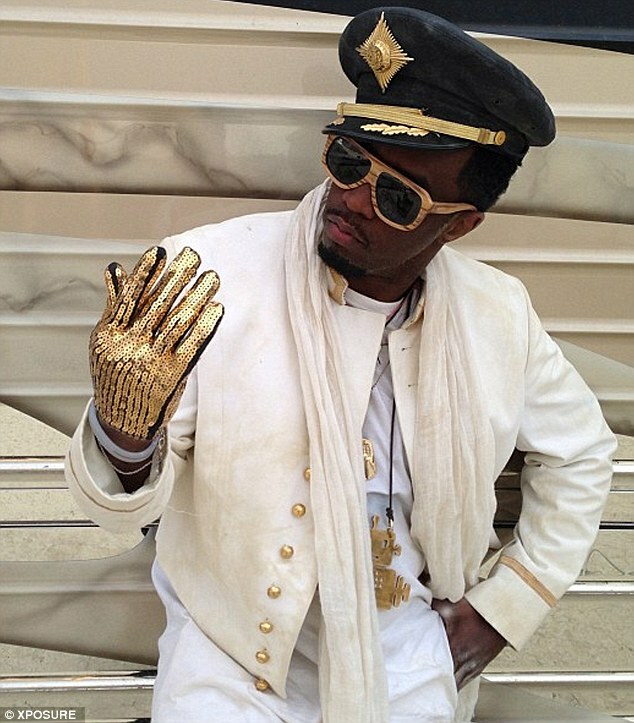 After his experience in the desert, Diddy also posted a snap of himself on Twitter and Instagram in which he is seen wearing a gold glove and a sailor's hat. He wears the accessories with a military-style jacket and a large robot medallion. 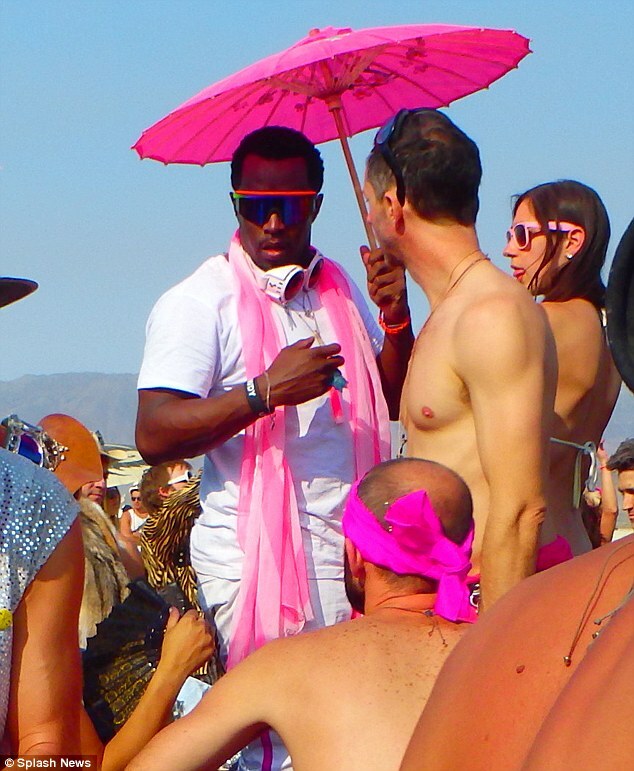 It is unknown how long Diddy stayed at Burning Man for and what his temporary living conditions were like. Most people who descend on Black Rock Desert either set up communal camps or stay in RVs. But considering Diddy's wealth and what he arrived and departed from the desert in, it is most likely that the rapper was not slumming it. His girlfriend Cassie tweeted a snap of herself posing in front of the couple's private plane as they prepared to leave the desert on Monday. 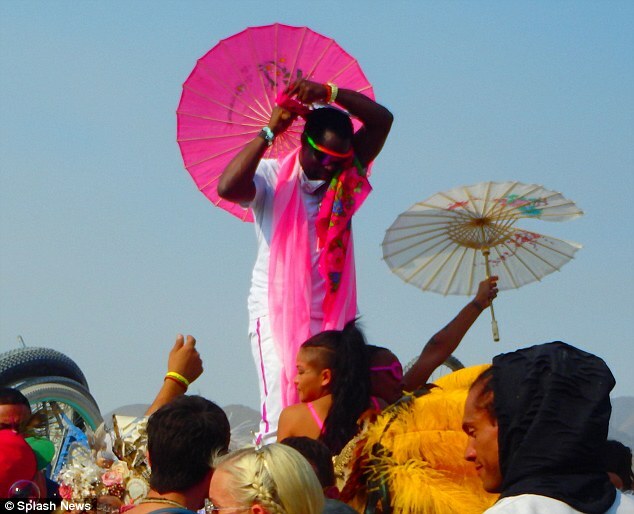 Burning Man is a one week communal festival - of art, radical self-expression, and radical self-reliance - that one can barely explain to others who are not present. Other celebrity attendees this year were Stacy Keibler and Victoria's Secret supermodel Candice Swanepoel. Stacy, 33, also shared a few snaps of her 'life-changing' experience earlier this week. In one image, the ex-girlfriend of George Clooney is seen baring her long, lean figure in a revealing, bohemian ensemble consisting of a bralette, boyish underwear, and cape covering her derriere, as flared leg warmers flow from her knees to the her feet. 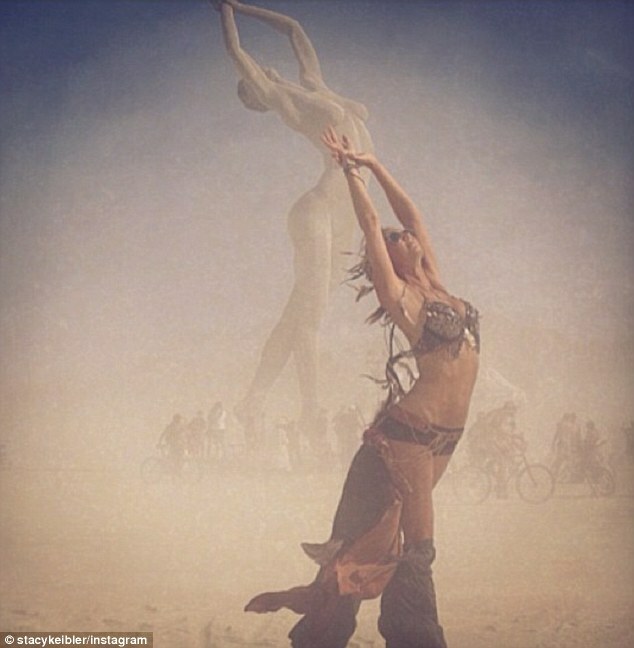 Mimicking the statue behind her, Stacy curved her spine and lifted her arms in the air as she stood on the dusty sand.